Librarians are at the forefront of many discussions and actions related to advancing the open access movement. We often talk about the need to change the culture of researchers in academia. Researchers need to understand the importance of the issues and their rights as authors – then put this into action by changing their scholarly communications practices. It is the researchers that have the real power to create change in academic publishing. By “researchers” though we’re usually referring to the disciplinary faculty we support… but what about researching librarians? Increasingly, librarians are publishing researchers in their own right. Indeed, it is a job requirement of many academic librarians. So why isn’t there a stronger movement within our own community of scholars to change our scholarly communications systems, and culture, to be more open? Even though we preach to other researchers at our institutions about the benefits of publishing in gold OA journals, or archiving copies of manuscripts in repositories, we have a dismal track record of following through on this ourselves. So, there is a problem – but what is the solution? The authors of this paper hope to ignite this discussion among librarians with their analysis of the openness of the main Library and Information Science (LIS) journals in our field. 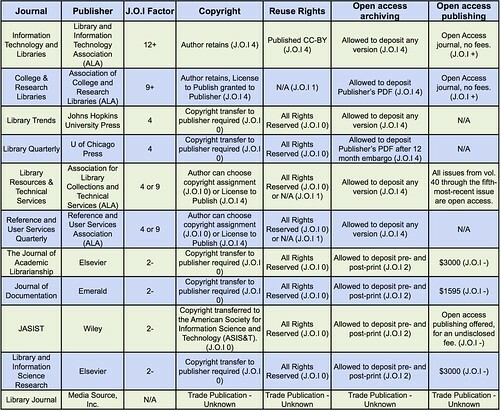 They adapt the “How Open Is It?” scale produced by SPARC/PLOS to propose a new measure: the “Journal Openness Index” (J.O.I.). And proceed to code 111 LIS journals according to this criteria, then apply the J.O.I. Factor to 11 “prestige” LIS journals (as identified by Nixon, 2013). Information Technology and Libraries, published by Library and Information Technology Association/ALA, comes out on top with another ALA publication, College & Research Libraries (C&RL), close behind (see Table 2). Unsurprisingly, commercial publishers land at the bottom of the list. An aside: In the Library with the Lead Pipe runs on a blog-style format which allows comments and discussion at the end of the article. There is an interesting back and forth in the Comments between the current editor of C&RL and Vandegrift. The article did receive a flurry of attention back in April 2014 when first posted (see some of the trackbacks in the Comments section), but this has now died down. I share the authors’ desire for furious and fair debate in this arena. However, I am continually surprised, and disappointed, by the apparent apathy of many librarians on scholarly communications topics – especially related to their own research output. How can we account for this? Our C-EBLIP Journal Club met today to discuss this article and also the topic of librarian values regarding their own research/publishing activities. We had a wide-ranging and compelling discussion… but kept arriving back at the distorted importance placed on various metrics like the impact factor. We need to satisfy our tenure and promotion committees just as any other faculty member. So, long-standing traditional proxies for “quality” are slow to change. We did not solve all the problems of the [academic] world at Journal Club today, but I think we came a little closer to some understanding of what some of those problems are. This blog post was originally posted on the blog, Open Access @ UofS Library. My two states or situations are that of librarian and researcher. One of the main reasons I wanted to work in an academic setting was the idea that I could conduct research; that I could be an academic as well as a librarian. That’s always been a strong appeal for me. I was lucky in that the University of Saskatchewan Library has a robust requirement for research that I’ve embraced. In my 9 years at the U of S, I’ve discovered that many of my colleagues also have been attracted to the research component, although it’s not all easy, all the time. What I like about the idea of liminality is that it can be either/or and both/and. I can be either a librarian or a researcher. I can be both a librarian and a researcher. I can wear one hat. I can wear two hats. (/Dr. Suess) There’s a flexibility in the space between being a librarian and a researcher. It contains both and it’s fluid and constantly shifting. That seems to suit the current climate, doesn’t it? Change is the new black so you might as well hunker down and hang on as best you can. But it’s not about just hanging on. It’s surviving and thriving in that mysterious liminal space between librarian and researcher. How? I’ve been thinking, writing, and doing research about librarians as researchers for a couple of years now, and I started within my own context. I first thought about why librarians do research. The first things I came up with (and remember, this is from out of my own head based on what I was experiencing myself – going for tenure and promotion as a librarian faculty member) was “so that we can get tenure and then promotion” and then “because we have to.” There wasn’t a lot of talk about other reasons to conduct research. The academic requirements are vast and at times overpowering. Well, that didn’t seem to be enough, or sustainable! There had to be more of a reason to do research other than the fact that we need to do research to get tenure. No wonder librarians can feel uneasy about the research process. There’s this constant need to quantify so we can put together the right basket of goodies in order to move forward in our careers. What we need to unpack is what is underneath the output. We need the why before we can get to the how and the what of research. While it is important to have guidelines on what requirements need to be met, attention needs to be given to the other aspects of why research is important, and important in our academic context. It’s important outside of the academic context, too. To me, the focus on LIS research should be on research as it enriches our discipline, enables our practice, and contributes to our immediate communities and beyond. I sometimes get the sense that we might not feel a part of the University research landscape. No, we are not researching new vaccines, or cures for diseases, or ways to conserve water, or feed hungry people. But our research, research as it pertains to our practice as librarians, can enrich the profession as a whole. With a mandate for research, librarians here are in a unique position to be able to pursue their research interests, research various areas of practice, and implement research findings in order to better serve our user groups on and off campus. And as practitioner-researchers, we come at things from the perspective of practice. We’re not looking at issues from a wholly theoretical vantage point, although our research can indeed be theoretical. We’re in the trenches, doing the work, and finding ways to get things done. We’re existing in that liminal space between librarian and researcher, where the lines are blurred and we’re wearing both hats simultaneously. When librarian-research is set alongside research coming from LIS scholars, I think we can get a more complete picture. If research is perceived to be a meaningful process by which we add to the body of knowledge in our field and contribute to our professional practice, we as librarian-researchers can perhaps have an easier relationship with our research pursuits. Adding meaning for ourselves and seeing the larger value of our research endeavours can add focus to our tasks as researchers and provide comfort in our liminal space.